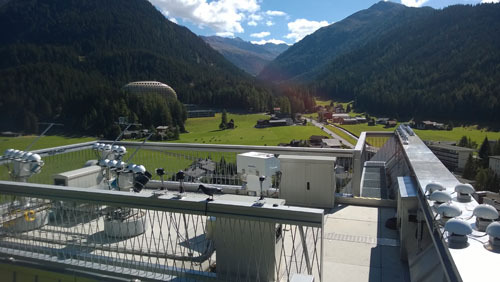 A GAW regional UV calibration center for the European region (WMO RA VI (Europe)) has been established at PMOD/WRC (Davos, Switzerland) since January 1, 2008. Its main function is to ensure that the data submitted to the GAW World UV data Centre (WOUDC) operated by the Meteorological Service of Canada in Toronto is of known and adequate quality to meet the needs of the scientific community. By its activities, the European Ultraviolet Calibration Center aims at improving the data quality in the European GAW UV network and at harmonising the results from different stations and monitoring programs in order to ensure representative and consistent UV radiation data on a European scale. As of 1st January 2013, the PMOD/WRC has been recognized as a World Calibration Center (WCC) for UV radiation for the World Meteorological Organization, Global Atmosphere Watch Program (WCC-UV). The first term of reference for the WCC-UV is to assist WMO Members operating WMO/GAW stations to link their UV radiation observations to the WMO/GAW Reference Scale through comparisons of the station instruments with the standard instruments operated by PMOD/WRC. Therefore, one UV broadband intercomparsion was organized by the WCC-UV in 2006 and a second one is announced for summer 2017. The first UV broadband radiometer campaign organized by PMOD/WRC was within the COST Action 726 "Long term changes and climatology of UV radiation over Europe". 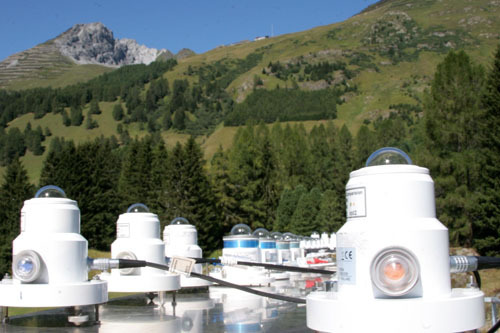 A total of 36 radiometers from 16 European countries participated at the campaign in summer 2006. The atmospheric conditions during the campaign varied between fully overcast to clear skies and allowed a reliable calibration for the majority of instruments. A formerly novel calibration methodology using the spectral as well as the angular response functions measured in the laboratory provided remarkable agreement with the reference spectroradiometer, with expanded uncertainties (k=2) of 7% for the most stable instruments. The measurements of the broadband radiometers were analysed both with the PMOD/WRC provided calibration as well as the prior calibration from the home institutes. The relative differences between the measurements using the prior calibration and the reference spectroradiometer varied between excellent agreement to differences larger than 50% for specific instruments. The absolute calibration is supported by CMC's within the CIPM MRA as PMOD/WRC follows the requirements for the competence of testing and calibration laboratories according to ISO/IEC 17025. PMOD/WRC is a designated institute of the Swiss Federal Office of Metrology, the Swiss signatory of the CIPM MRA (International Committee for Weights and Measures - Mutual Recognition Arrangement). Participating instruments should arrive before 19th June and will be send back after the 18th August 2017. The shipping instructions include document regarding the delivery of the instruments to Davos,Switzerland. Although the calibration itself is free-of-charge, instrument shipping costs are the responsibility of the participants. To ensure a calibration of the radiometers, the instruments must arrive in very good condition. Special care must be taken to the humidity of the sensors. Radiometers arriving with wet desiccant typically need several weeks to stabilize after the renewal of the drying agent which will exceed the time frame of the calibration period. Although the calibration facility has its own analog data logger and power supply, the instruments must be shipped with its connection cable. Digital radiometers must come its data logger. Like the COST 726 calibration campaign in 2006, the data of the instruments will be processed using the original and the new calibration factors. Therefore, we request the participants to send the calibration factors or calibration matrixes together with the registration. Please do not send any instruments without registration and join with only one reference instrument per participant. 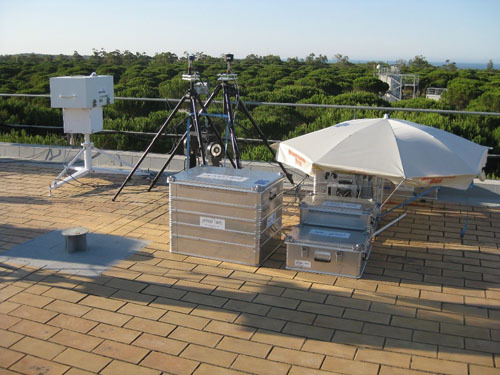 Picture of the QASUME and QASUMEII reference spectroradiometers during a site audit in El Arenosillo, Spain. For the absolute calibration synchronized measurements from the radiometers and the reference spectroradiometer are acquired using the sun as light source. At least three days without precipitation are necessary for the calibration. The measurement period must include one clear sky day. During the summer month in Davos these requirements typically lead to are calibration period of approx. three weeks. Picture of the outdoor roof platform of PMOD/WRC. Broadband radiometers are mounted on the long bench seen on the right. The blue entrance optic of QASUME is mounted in the center of the front balustrade (next to the plastic bird). The optical table of the SRF setup is shown in the picture below. The light of a 1000 W Xenon lamp is focused to the entrance slit of an Acton SP2500 double monochromator. The UV broadband radiometer is illuminated by monochromatic light in the wavelength range from 270 to 420 nm. A Silicon diode monitors the stability of the system. 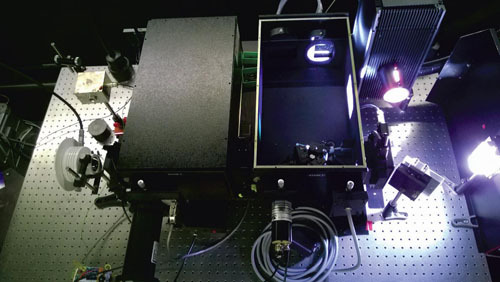 Picture of the SRF Setup showing the light source on the right, the open SP2500 monochromator and the test instrument on the left. The measurement of the ARF is carried out on a 3 m long optical bench. The light source is again a 1000 W Xenon lamp. 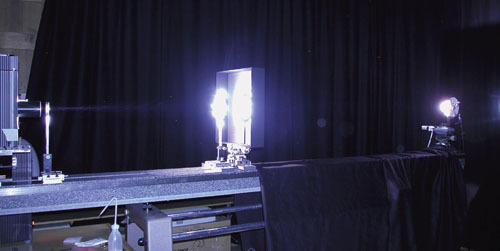 The collimated beam illuminates the radiometer mounted on a goniometer. Picture of the ARF setup with the Xenon lamp on the left and the radiometer mounted on a goniometer on the right. In the center of the bench a baffle and bandbass filter is mounted.